Tuesday, October 17, 2017:Annexing Raqqa- Ethnic Cleansing & Where's ISIS ? Raqqa has been stolen from Syria by US backed proxies- The 5 eyes media calls it liberation. They report that Raqqa has been "freed" I call it annexation. Calling this annexation anything except what it is.... would be misleading. Obfuscating. Intentionally so, I would add. 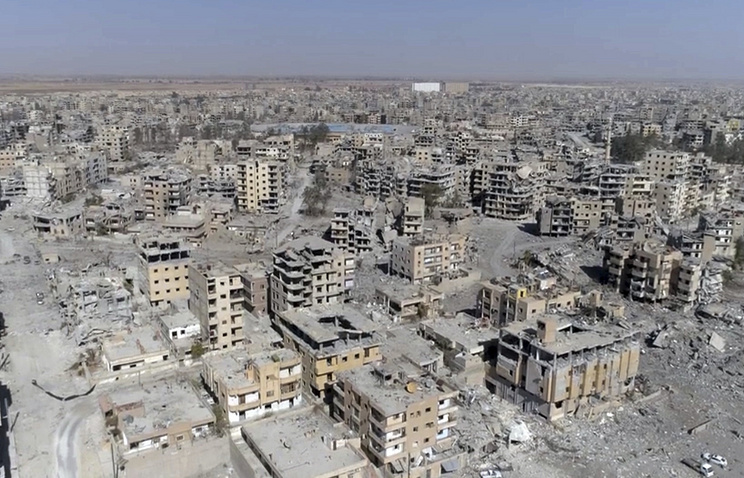 The annexation of Raqqa came at great cost to the civilian population- A fact repeatedly mentioned here- Not including the massive civilian casualties, there are reports of nearly 300,000 internally displaced from Raqqa. MOSCOW, November 8. /TASS/. The bodies of over 8,000 Syrians killed in bombing raids by the US-led coalition have been found in mass graves in Syria's Raqqa after the rubble was partially cleared away, Russian Foreign Ministry Spokeswoman Maria Zakharova said on Thursday. "Last week, the Syrian government, in its letters addressed to the UN secretary general and the UN Security Council president, provided the tragic statistics on the victims of the coalition's bombing raids in the city of Raqqa during its ‘liberation' from ISIL (former name of the Islamic State terror group, outlawed in Russia - TASS)," she noted. "The bodies of over 4,000 people were found while clearing away the rubble in two of the city's residential neighborhoods left over from the airstrikes and also around the stadium and the zoo. Those were mainly women, the elderly and children. In addition, a mass grave where more than 2,500 people were buried was uncovered at a farm near a pediatric clinic and the National Hospital, while another burial site was opened near Al-Panorama where 1,500 bombing raids' victims were buried." "The letters stressed that to date just two percent of the rubble had been cleared away in Raqqa, which had been literally razed to the ground," Zakharova emphasized. According to the diplomat, the statistics turned out to be in stark contrast with "the hysterical reaction expressed by the US and other Western countries with respect to protecting Syrians' rights," and "the information provided in recent reports by various Western NGOs on the situation in Raqqa." Let me state what is obvious, and annoyingly so, yet again! We are talking about minimally 270,000 resident Syrians, probably more, from just one city who have beenintentionally displaced in order to remake the region... Redraw borders. And present a meme of justice being served. Oh, really? The US bombed and bombed Raqqa while the SDF lay siege to the city- what a hell that had to have been for the residents! I shudder. 8,000 dead Syrians in just 2 percent of the cleared rubble- There was no mistake made when I rightfully labeled this ethnic cleansing. Which connects right back to the published article, here, two days later. October 19/2017 Enormous Flag of Ocalan Raised In Raqqa- Greater Kurdistan Dead? "I'd describe this as a huge flipping of the bird to the dead. The displaced. The ethnically cleansed. To the nation state of Syria. Only full awareness that the USrael has their back could explain this brazen display." Today ? More then a year later ? It's even more obvious that ethnic cleansing was conducted. It's even more obvious it was done wantonly and brazenly and then it was gloated on. Of course there was the documented use by the coalition of white phosphorus in Raqqa.